One issue that President Donald Trump's hard-line supporters care most about is immigration. While the president has signed three executive orders on the subject, he has said nothing about the so-called dreamers, undocumented young people who were brought to the U.S. as children and protected under the 2012 Deferred Action for Childhood Arrivals Program or DACA. The immigration restrictionists are not happy. “DACA must be ended,” wrote Ronald W. Mortenson last month for a Center for Immigration Studies blog. “We fully expect them to do so,” wrote Roy Beck of Numbers USA, announcing an end-DACA Twitter campaign in January. In Raleigh, North Carolina, William Gheen is taking protest a step further. President of his own political action committee, Americans for Legal Immigration, Gheen says he was an early endorser of the president. But if Trump does not end DACA in a matter of days, ALIPAC will withdraw its support. While Trump promised unequivocally to undo DACA during his campaign, he later said as president that it was a “very, very tough” issue for him. Gheen is giving the president until April 15th to do away with DACA, not an arbitrary deadline since April 15th is the annual deadline for Americans to file their taxes. It makes the symbolic point that Gheen does not want any DACA recipients getting any benefits paid for by taxpayers. “We want DACA illegal immigrants prevented from receiving jobs, government benefits, welfare, and any other taxpayer resource, and we want them deported when detected by law enforcement during their routine duties,” he said. Gheen grew up in mountainous western North Carolina. In college, he was a Democrat, actively helping to register minority voters. But concerns about immigration turned him into an independent, and he has been fighting illegal immigration for the past 12 years. The ALIPAC website says the PAC has fewer than 20,000 members and Gheen's is the only name associated with it. But as the president of a registered federal PAC, he can solicit donations. Like many immigration hardliners, Gheen sees the DACA issue as one of fairness since DACA recipients are being singled out from other undocumented immigrants. “We have a DACA amnesty that's in place. That's not backed by legislation, which means the voice of the American people has been completely override (sic) with the actual policies of the United States,” he said. To Nowrasteh, DACA is not an amnesty program as it does not give recipients a path to permanent residency or a chance to get citizenship. “It merely defers them from deportation, and it grants them work permits in the meantime,” Nowrasteh told VOA. Since the program's implementation in 2012, at least 750,000 undocumented immigrants have been protected from deportation under DACA, signed by former President Barack Obama. A disproportionate number live in North Carolina. U.S. Citizenship and Immigration Services shows almost 50,000 DACA recipients registered in the state. 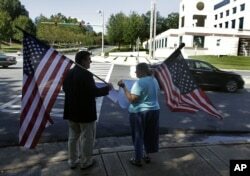 William Gheen, left, president of the political action committee ALIPAC, protests near a fundraiser for Gov. Rick Perry in Charlotte, North Carolina, Sept. 29, 2011. The group was protesting Perry's support of in-state tuition for illegal aliens. When ALIPAC endorsed Trump, it broke a 10-year policy of not endorsing presidential candidates. Gheen says with admiration that Trump took "ownership" of the immigration issue. Gheen has been surprised, given his background as a Democrat and champion of minorities, to find himself “jumped on” over his current anti-immigration stance. He says defiantly he won't back down in the face of threats to his job and his life or because of being labeled a racist. “As an American, I belong to the most racially inclusive and tolerant civilization that has ever existed in human history and that I deserve some credit for me and my family's part in that,” he says.